Former Barrie Colts goalie passes in 401 accident. #OHL - Very Barrie Colts | A website covering the Barrie Colts of the OHL. 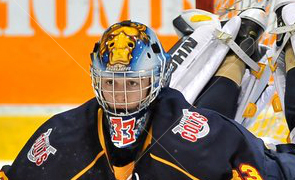 On Friday, July 7th former Barrie Colts goaltender John Chartrand passed away in a car accident in Toronto. Reports coming out say that the 24 year old died when his car crashed into the back of a truck on Highway 401 in the east end of the GTA near Highway 404. 680 News out of Toronto says that the accident happened close to 3:00 am. At the 2009 OHL Priority Selection Draft, John was drafted by the Niagara IceDogs in the 4th round, 80th overall. Over a couple of seasons he would play in 16 games with Niagara. IceDogs are heartbroken today to hear of the passing of John Chartrand, a former IceDogs player. Thoughts and prayers are with the family. John played with Barrie in the 2010-11 season after being traded over from the Niagara IceDogs. He would play in 23 games with Barrie, posting a 4.93GAA with a .870 SAV%. The following season would see him move to the Belleville Bulls. In December of 2012, John Chartrand filed statements accusing the Barrie Colts, and team doctors of clearing him to play just days after being in a car accident that left him hospitalized. Following his OHL career, Chartrand would go on to play CIS hockey for Nipissing University in 2013-14. Here is a statement released from the Barrie Colts. The entire Barrie Colts organization is saddened to hear about the passing of our former player John Chartrand. Although John only had a short stint with our hockey club, he will always be a part of the Colts family. Our thoughts and prayers are with the Chartrand family through this difficult time. Police say that they are still investigating the accident. Our sincerest condolences go out to his family and friends. RIP.